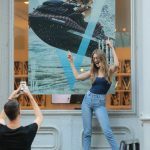 With the cover and a multiple-page spread in fashion glossy V Magazine featuring the world’s top supermodel, Gigi Hadid, LOOK Marketing secured a big public relations win for our client Sea-Doo. 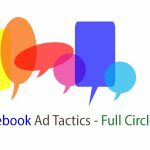 The culmination of months of LOOK Marketing’s behind the scenes PR and logistics work resulted in over 75 million people across the world being exposed to the Sea-Doo brand from this publicity campaign – just in the first day and a half. The V Magazine cover and article excerpts were shared by Gigi Hadid to her nearly 55 million social media fans, as well as picked up and published by dozens of top media sites including the Daily Mail. V Magazine July cover with Gigi Hadid riding Sea-Doo RXP-X 300. Supermodel Gigi Hadid shares the V Magazine cover with her Instagram fans. Daily Mail highlights V Magazine cover of supermodel Gigi Hadid outfitted in a custom Fendi life jacket racing across the waters of Miami on a matching Fendi wrapped Sea-Doo RXP-X 300. Entertainment Online Canada headlines with V Magazine Gigi Hadid and Sea-Doo cover. LOOK has years of PR experience activating influencer and celebrity projects, some opportunities simply come our way more than others. This opportunity came about through a friend of friend of a friend and we simply took the opportunity and ran with it. We made our client’s involvement in the project very easy for V-Magazine. The easier we can make it for them the easier it is for them to say “yes” to us. We helped pick the right Sea-Doo model for the look the creative team wanted. We worked with a local Miami vehicle wrap company to deliver the unit and help with the Fendi wrap graphics. For the actual shoot, we made the Sea-Doo portion as turn-key as possible. It also helped that Gigi Hadid was a genuinely nice person, with a great work ethic, and admitted adrenaline junky. She listened intently to our instruction on-set and did indeed ride aggressively for a full four hour shoot. 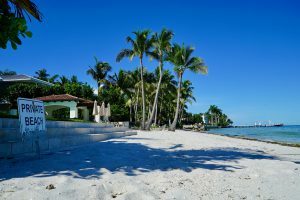 The private V-Magazine shoot location on Key Biscayne. 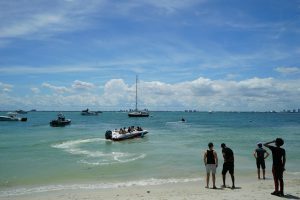 A busy day on Biscayne Bay was the location for the V-Magazine shoot with client BRP Sea-Doo. 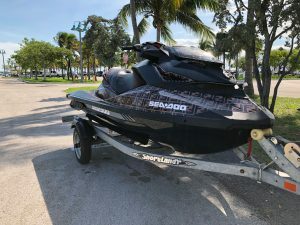 The custom Fendi wrap on the Sea-Doo RXP-X 300 watercraft connected the fully branded cover shot. 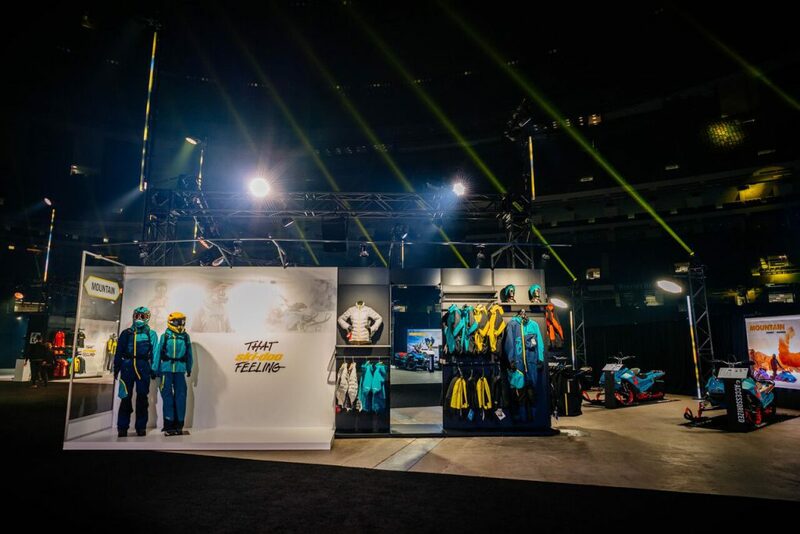 LOOK Marketing’s creative visual merchandising and trade show design specialists conceptualized and executed a showroom display and merchandise design project to highlight industry leading, client BRP Ski-Doo‘s 2019 collection of riding gear, clothes and accessories for its annual global dealer meeting. 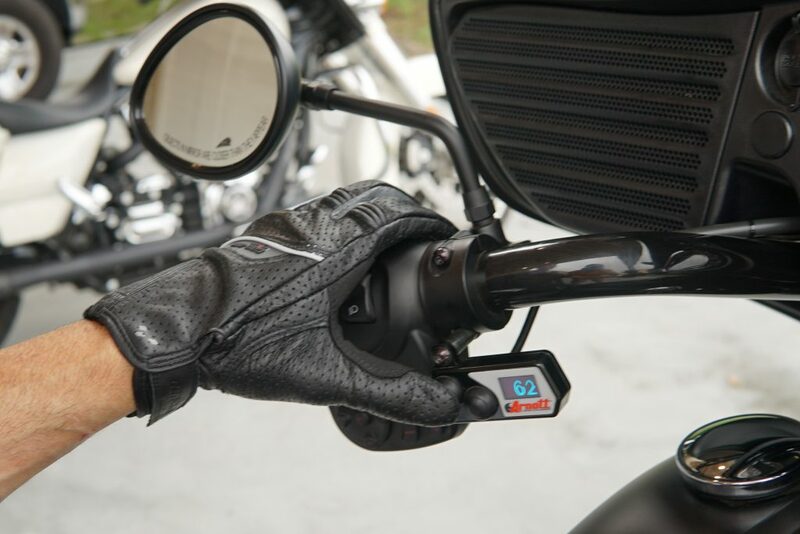 This was a business-to-business project aimed at inspiring the dealers to place wholesale orders on vehicles, accessories, clothing, riding gear and parts. The trade show space occupied 23,000 SQFT in New Orlean’s famed Mercedes Benz Super Dome. The space was designed in a circular pattern with the intention of creating a very dynamic and unique traffic flow experience for the trade show attendees. 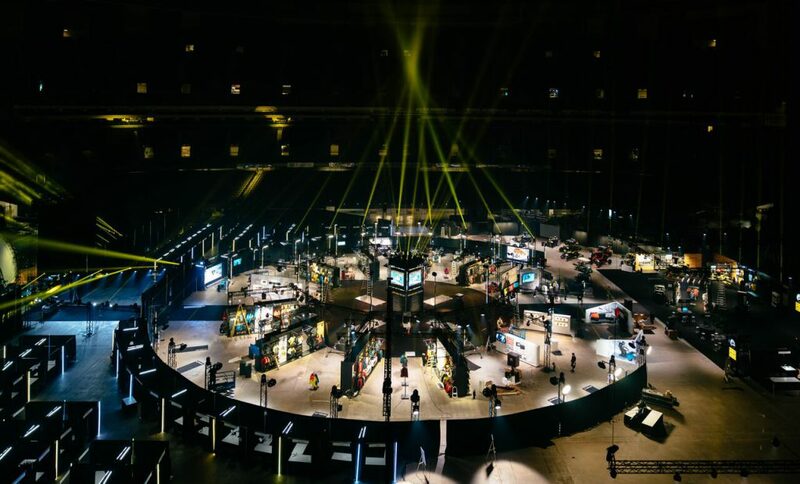 Aerial view of circular trade show space in Super Dome illustrating hub and spoke exhibition floor layout. Michele explains that the driving force for the show floor vignette highlighting the three-part layering philosophy for Ski-Doo’s riding gear was the client’s requirement that the show display be educational and effectively communicate the science of layering the riding gear from the base layer to the mid layer and finishing off with the outer layer. 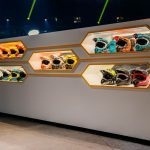 Completing the Ski-Doo riding gear and interactive layering floor section was a set of geometrically inspired podiums opposite each other. On each podium, three mannequins designated for women’s and men’s gear, respectively. The mannequins were dressed in various stages of the layer dressing. This was used to convey the three-part philosophy, and to further tie the visuals to the layering process expressed in the layering chart on the display wall. Rendering depicting Ski-Doo clothing and recommended layering methods. Detail of interactive layering panel wall display section at Club Ski-Doo. We used two auto-self white walls with matte finish. 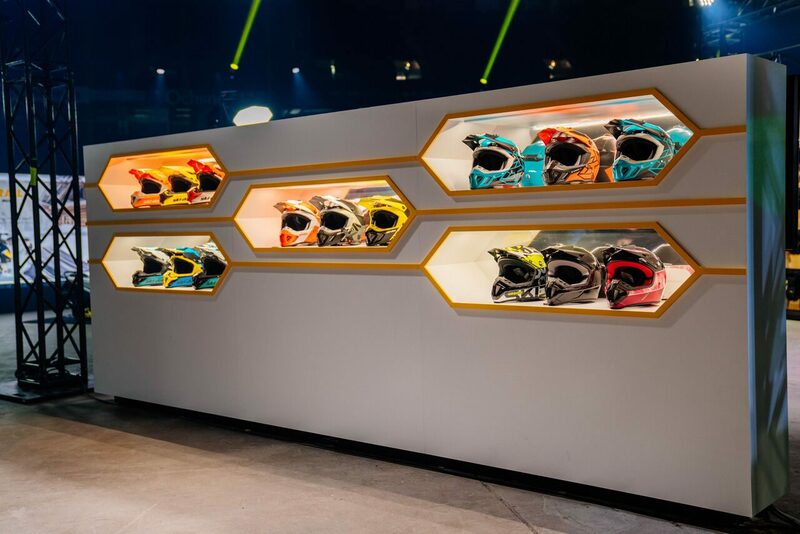 One of the displays showcased Ski-Doo’s Cross family helmets and the other highlighted Ski-Doo’s full face helmets. The design concept (see display rendering below) for the honeycombed niches that housed the Ski-Doo helmets were inspired by Ski-Doo’s use of the honeycomb shape in their marketing campaign. Each of the honeycombed niches were lighted and had a mirror finish on the back to ensure a better view of the graphics and details of each helmet. Rendering of of proposed space design for helmet section in trade show space for model year 2019 Club Sea-Doo. 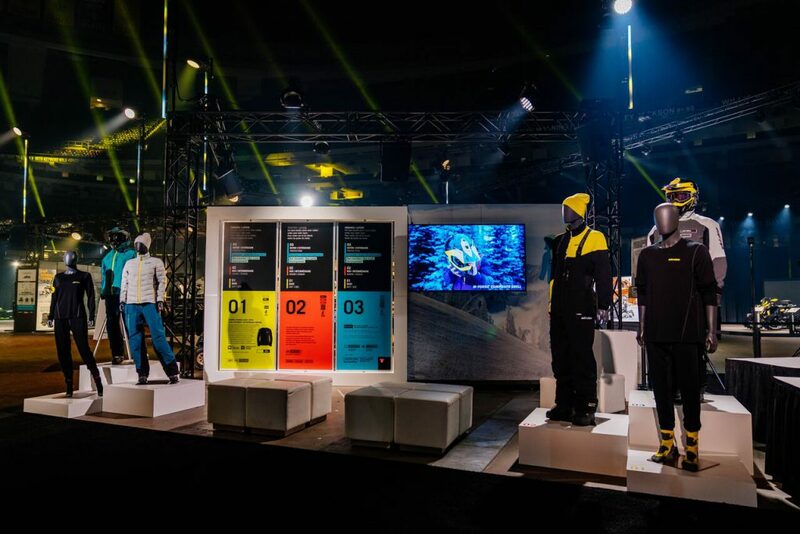 Elevating engineering feats to an art form with the Innovation wall display which exhibits Ski-Doos seven best innovative accessories. 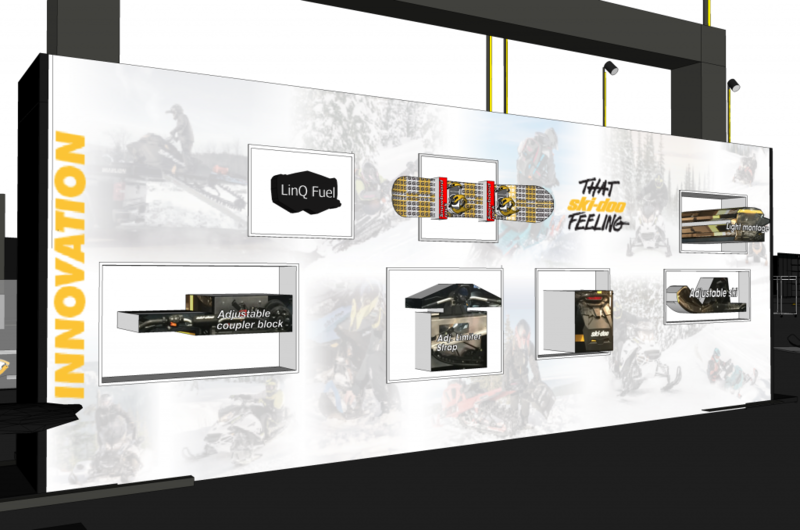 For the Innovation wall display, Michele explains that the “ultimate goal was to showcase Ski-Doo best innovative accessories.” In order to bring their show design concept (see rendering below) to life, the design team had a 24’ long wall built and covered with with slightly faded imagery of moments exemplifying the lifestyle associated with the tagline “That Ski-Doo Feeling”. Seven display niches were sculpted out of the wall – each niche with varying degrees of depth to best highlight the item contained within. The geometrically defined niches – either a square or rectangle – contained light fixtures to fully illuminate the innovative Ski-Doo accessories. 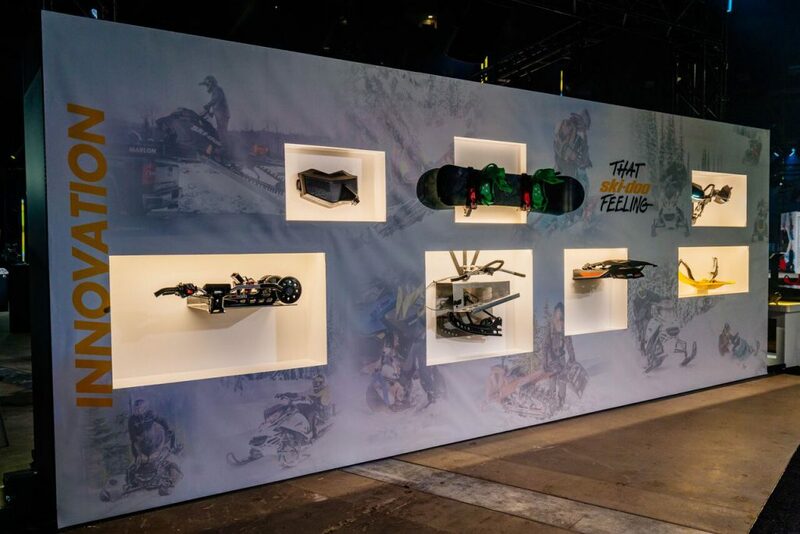 This show design evokes a feeling of an art gallery wall dedicated to important engineering accomplishments that contribute to the Ski-Doo product and enhance the Ski-Doo lifestyle of the ski rider. Club BRP -Ski-Doo Accessories Innovation design rendering. Ski-Doo has several lifestyle segmentations for which it produces specific clothing and riding gear. Shown here is the mountain segment. 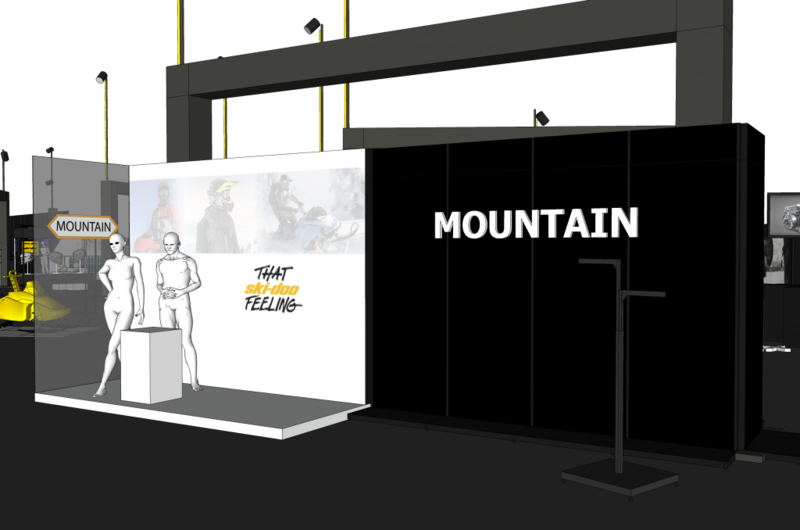 Expanded view of trade show floor space with focus on Ski-Doo’s Mountain clothing and riding gear. For the clothing and riding gear sections, the objective was to create an unforgettable and impactful 3-dimensional visual look book. The design team called this a “look-alike” window. 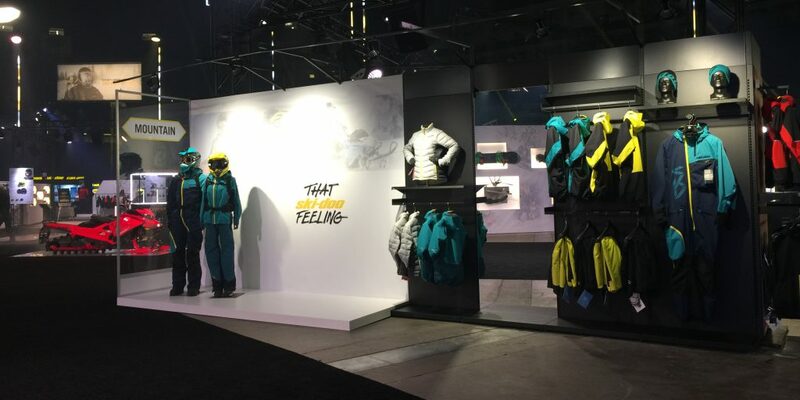 Its purpose was to bring attention to Ski-Doo’s most important soft goods segmentation line up. The driving factors shaping the aesthetic show design was the need to deliver a clean and minimalistic approach while ensuring that the star of the vignette – the clothes and riding gear wowed the trade show attendees. The team executed their design vision (see design rendering below and see above for delivered design) using a white, glossy material for the display. 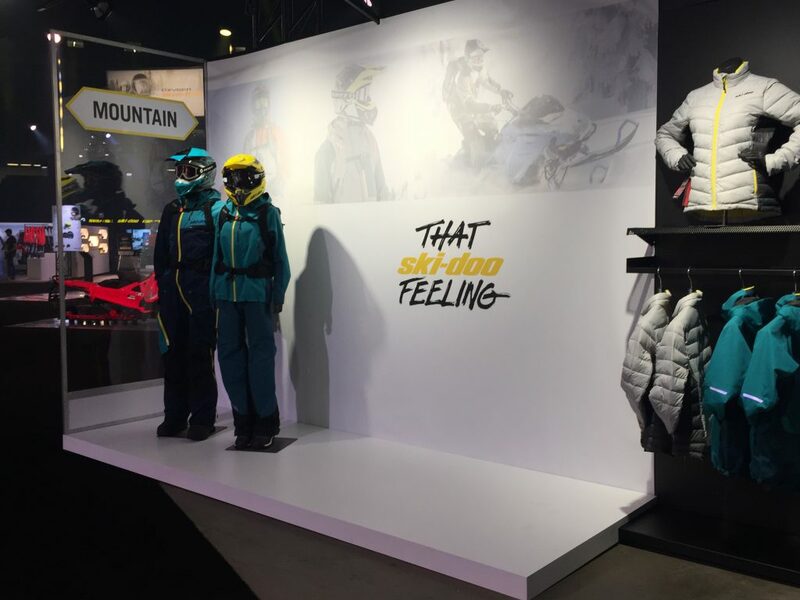 At the top of the display, faded imagery of Ski-Doo lifestyle shots and below that image section the tagline, “That Ski-Doo Feeling.” An acrylic window sporting signage identifying the specific Ski-Doo segment offered a feeling of a window display in a retail environment inviting shoppers to come take a closer look at the mannequins outfitted in Ski-Doo riding attire and accessories. 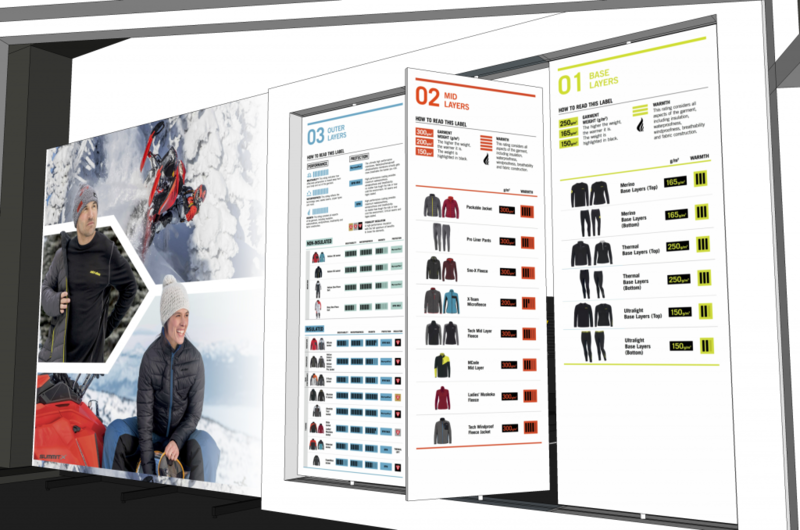 Mountain lifestyle section design rendering for the Club Ski-Doo trade show. 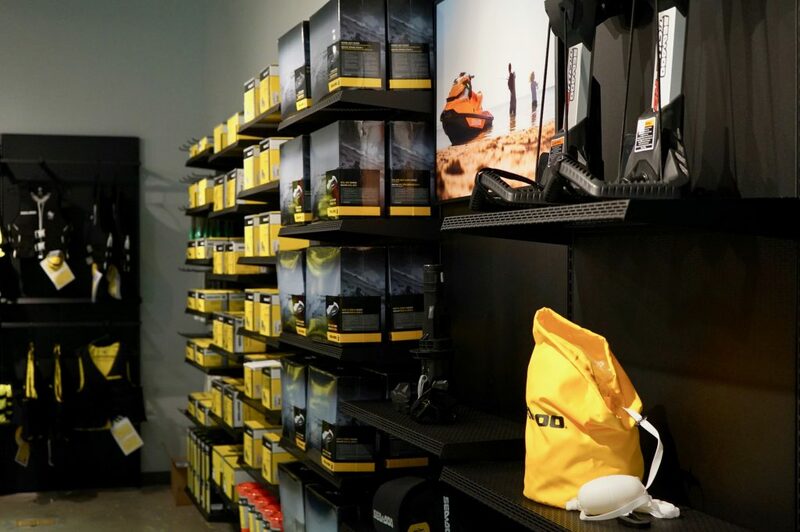 Merchandising Ski-Doo XPS products in a dramatic, contemporary fashion that aligns the product with the Ski-Doo brand and lifestyle. 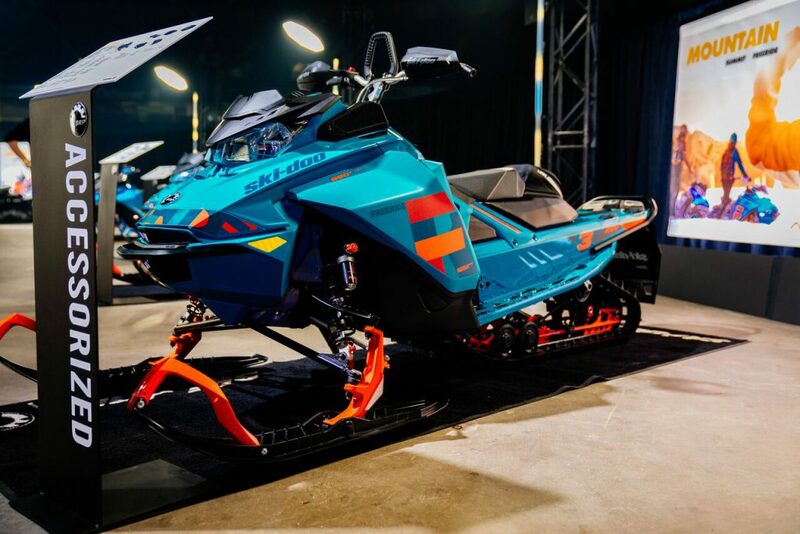 Positioning the Ski-Doo XPS oil and maintenance products to express the premium characteristics and quality of the product range was the show design team’s goal for the display concept (see rendering below). According to Michele, the team’s creative director, the merchandising team took inspiration from the product packaging graphics, logo and color scheme (which is silver and black). 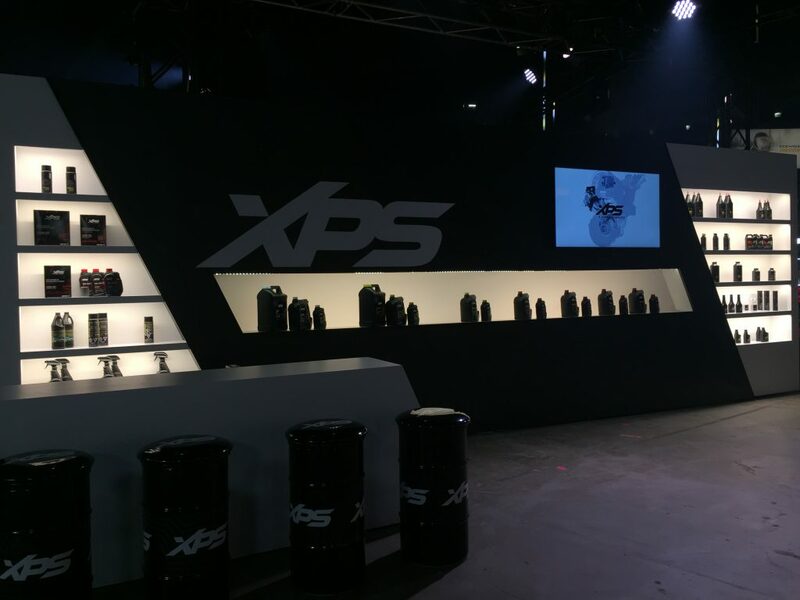 Within the matte black display wall, lighted recess shelving showcased groupings of the XPS oil and maintenance products as shown in the photo above. 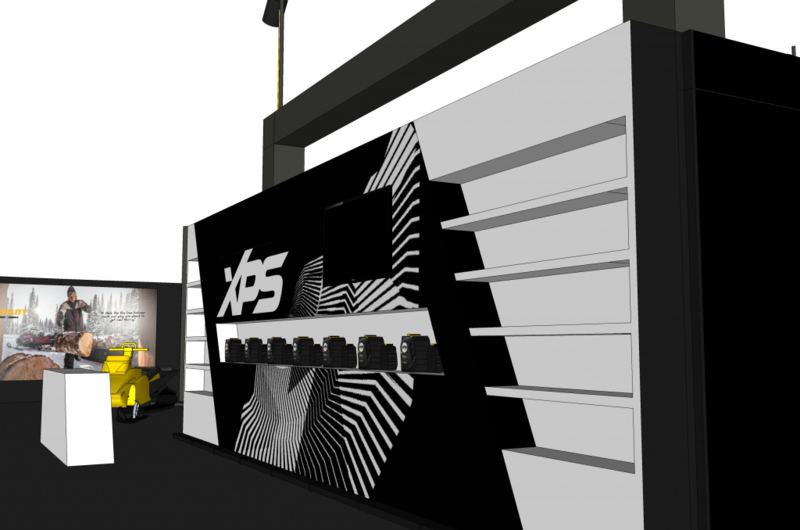 Display panel for Ski-Doo XPS products. 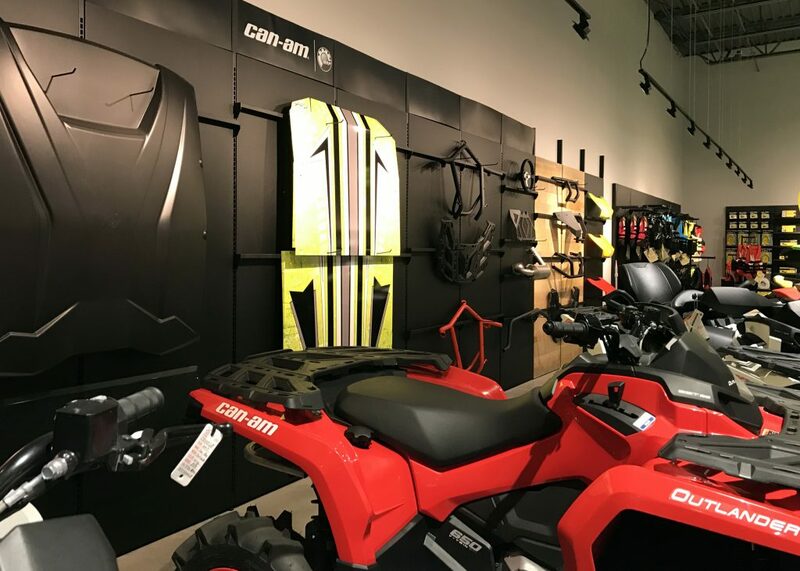 Color Harmony: Visual Merchandising and floor set with Ski-Doo snowmobiles to visually tie the riding gear and clothing with the Ski-Doo vehicle. 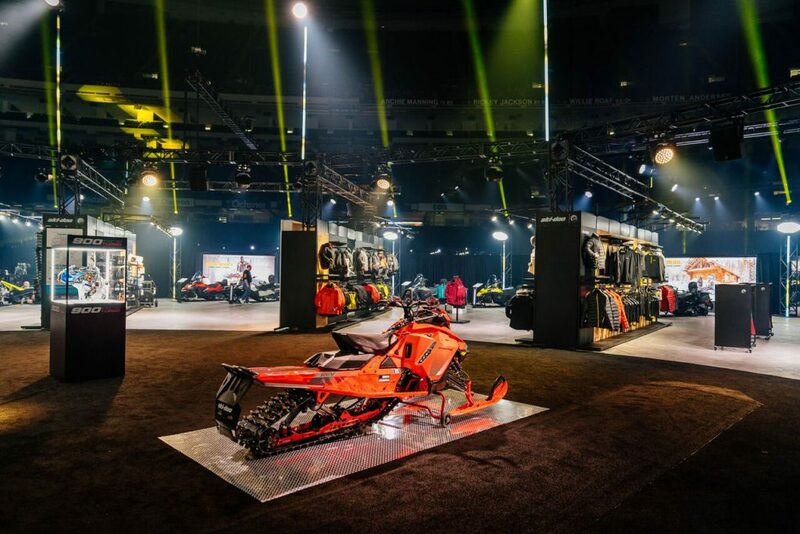 Powerful Possibilities: Display to highlight various accessories that complement the Ski-Doo snowmobile. This configuration allows dealers to visualize what is possible and to offer inspiration for design within their retail space. 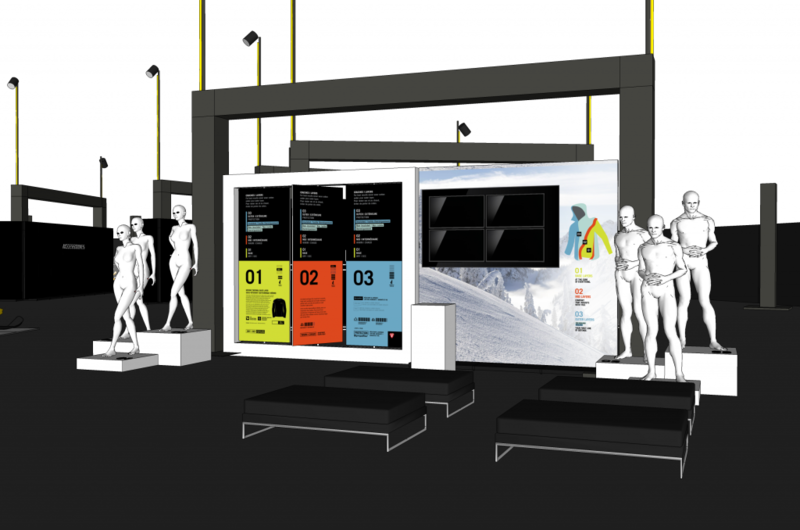 Hero Stand: Highlighting importance of Ski-Doo unit in trade show space. 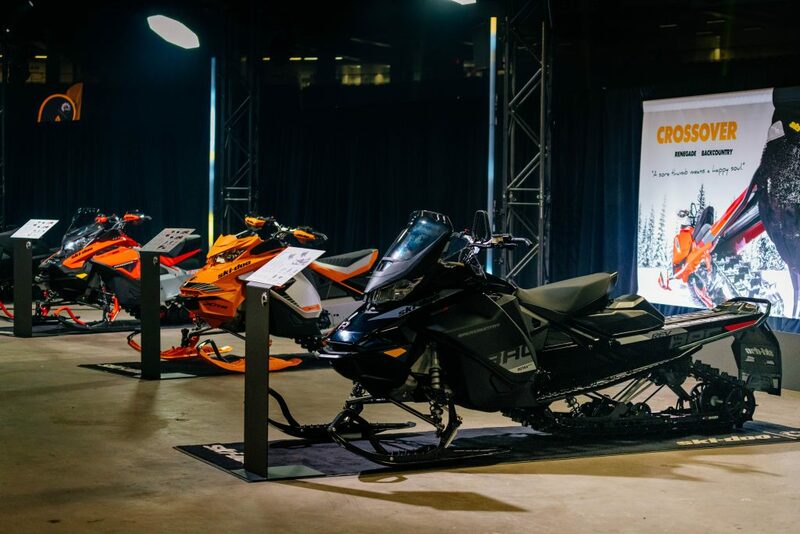 Ski-Doo vehicles displayed with walk around space and key information readily available for dealers to access. 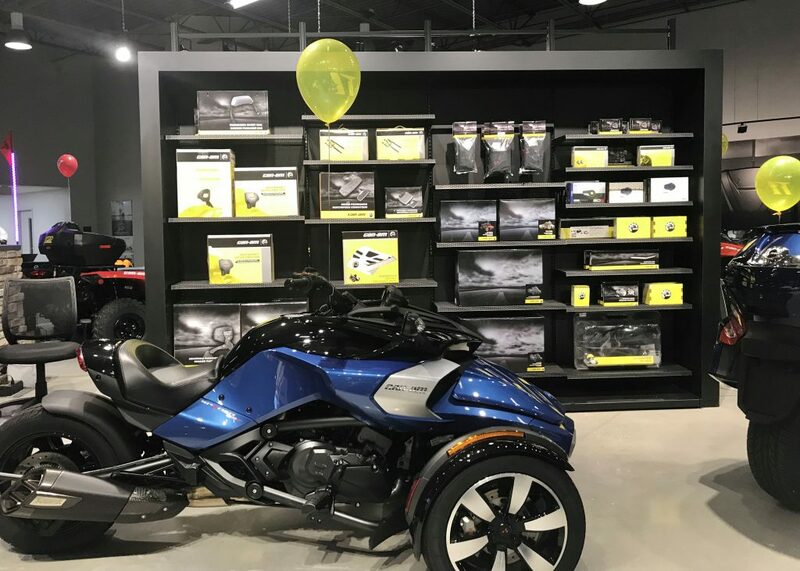 With plans to build a new mega-showroom underway, Route 1 Motorsports knew they wanted LOOK Marketing’s Director of Visual Merchandising, Michele Chenard and her team to design the showroom and store displays for BRP powersports’ brands Can-Am Off Road and Can-Am Spyder as well as Sea-Doo watercraft. 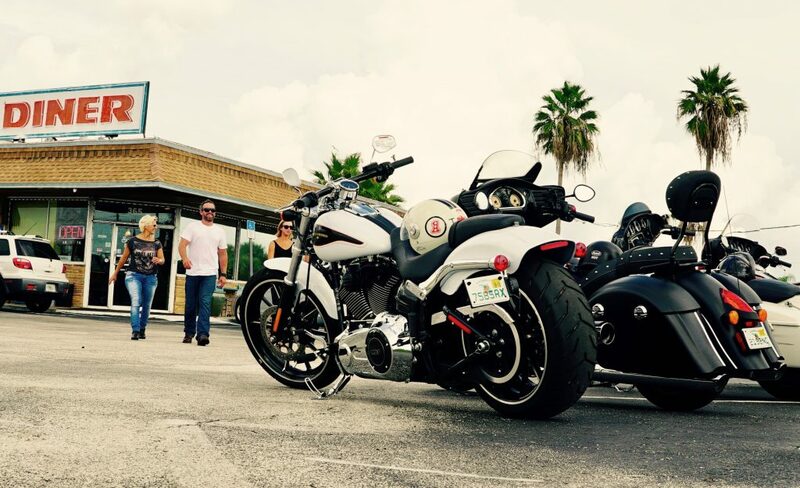 When Route 1 Motorsports officially opened the doors for business at to their new powersports dealership in Florida’s Brevard county – home to the iconic, history-making Space Coast, we were honored to have been there to celebrate this momentous event with them. Over the course of the evening, we captured a few photos of the showroom vignettes and product displays designed and styled by LOOK Marketing’s award-winning Visual Merchandising team. Organized and inviting display shelf filled with accessories and gear with vehicle vignette in foreground – offer consumers an enticing shopping environment that translates to an elevated consumer experience. Styled to sell. 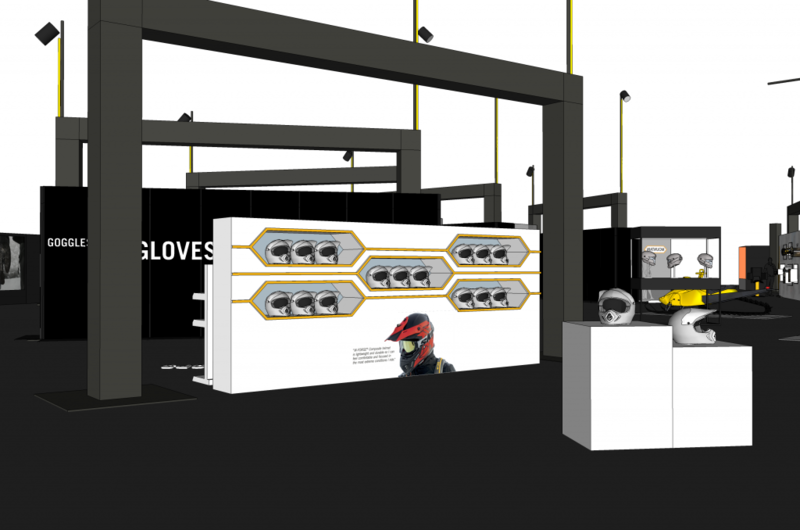 The science of merchandising design for powersports retailers. 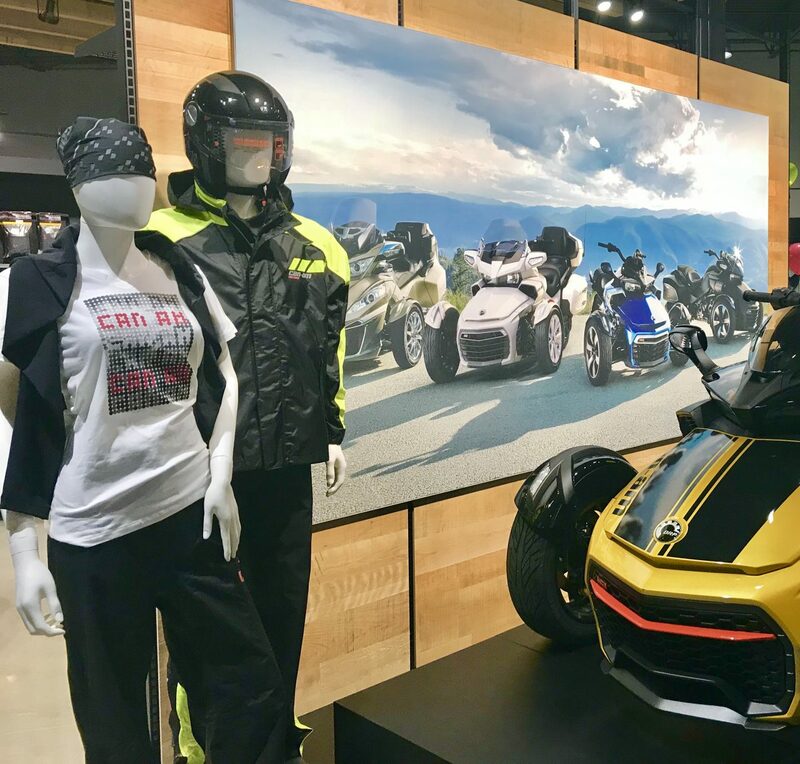 Artfully conveying the Can-Am Spyder lifestyle in this vignette with mannequins dressed in Can-Am riding gear set against backdrop of vehicles and one on display. All components from color, spacing, pattern and texture work harmoniously together to create a display that is an attention-getter and money maker. Smart store design optimizes every inch of available display space which in turn increases the amount for revenue making space. LOOK’s visual merchandising team combined the science of retail design with their artful eye for creating beautiful environments, and designed this revenue generating series of display and merchandise vignettes that are guaranteed sales makers. Harnessing the science of color theory and placement to create an attractive retail display wall. Eye-pleasing merchandise wall display presented in a visually rhythmic fashion makes it easy for shoppers to quickly find exactly what they need. It’s been a privilege to work with our friends at Route 1 Motorsports and contribute to their business success. We’ve enjoyed seeing their journey marking major milestones including the press event at the ground breaking, sharing the construction progress via social video and finally seeing it all come together at the grand opening festivities. 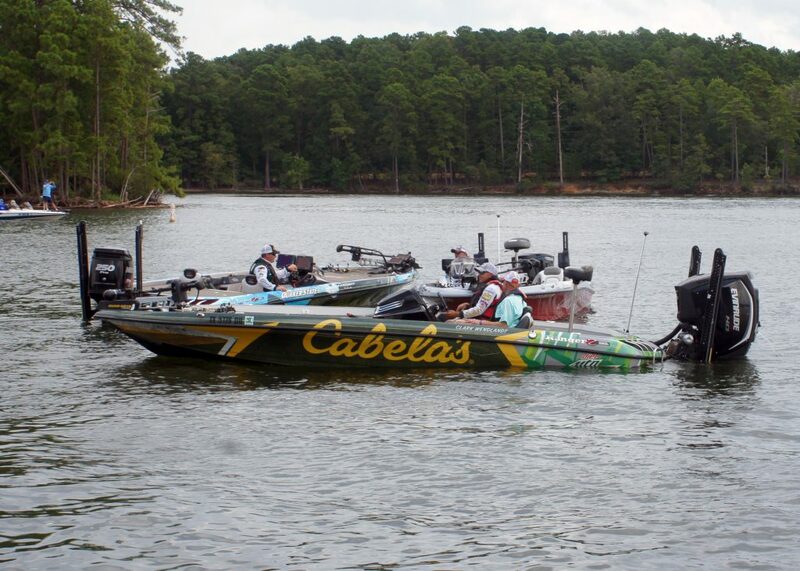 It’s one of the most prestigious professional bass fishing tournaments in the world, the Fishing League Worldwide’s Forrest Wood Cup. 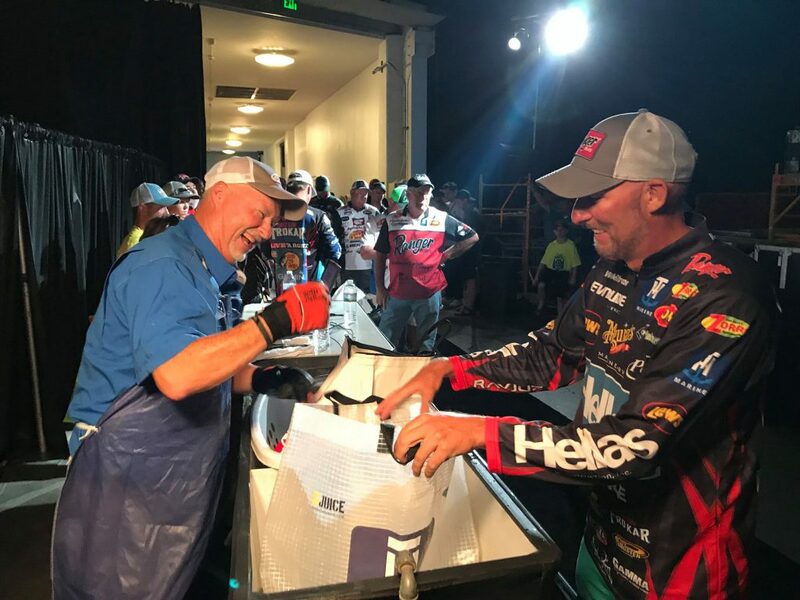 Our client Evinrude had a few of their pro-anglers vying for top spots in this world championship fishing tournament that took place in August 2017. 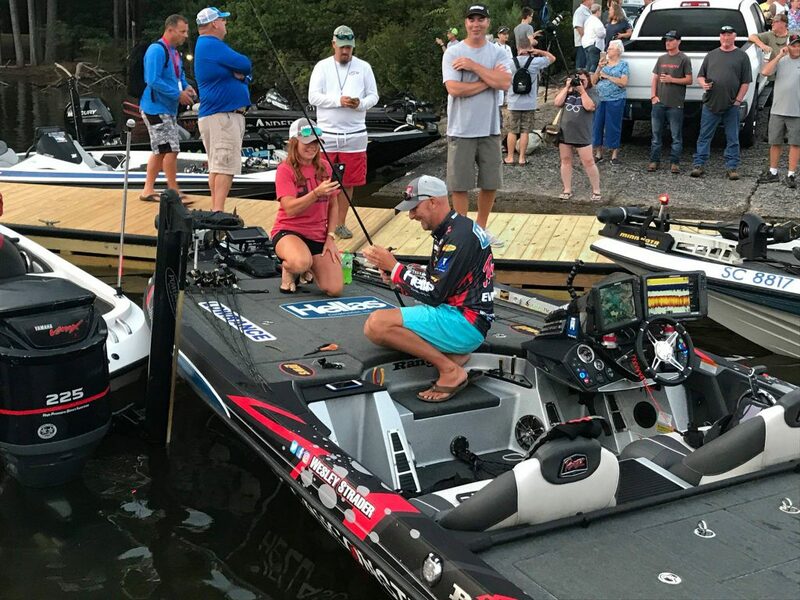 Evinrude also planned on offering test rides during this heavily attended multi-day event in Lake Murray, South Carolina. 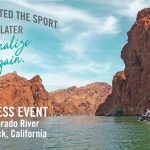 Capturing and publishing visual content from Evinrude attended fishing tournaments was one of several tactics based on our social media strategy to deliver informative and entertaining magazine-like experiences across Evinrude’s various social channels. 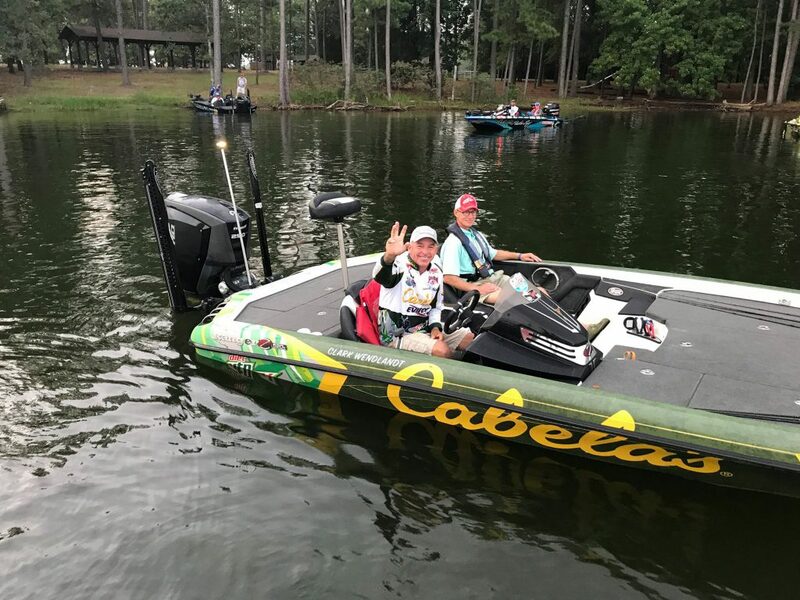 So we packed our cameras, smart phones and laptops, and made our way to Lake Murray to bring the tournament experience to Evinrude’s 145,000 social fans on Facebook, Instagram, Twitter and YouTube. Hundreds of photos were taken – including some cool 360-degree shots, along with several hours of video footage recorded. Many of the tournament photos were published to albums and collections on Facebook, Instagram, and Twitter. The event-based visual content was well received by fans. Some of the fan favorites (and ours, too!) from the event are shown below. It’s easy to see why the fans enjoyed these images – they express authentic, memorable moments and exude a friendly warmth that leaves you with a smile. Kind of like the pictures you’d take yourself and share with your friends. 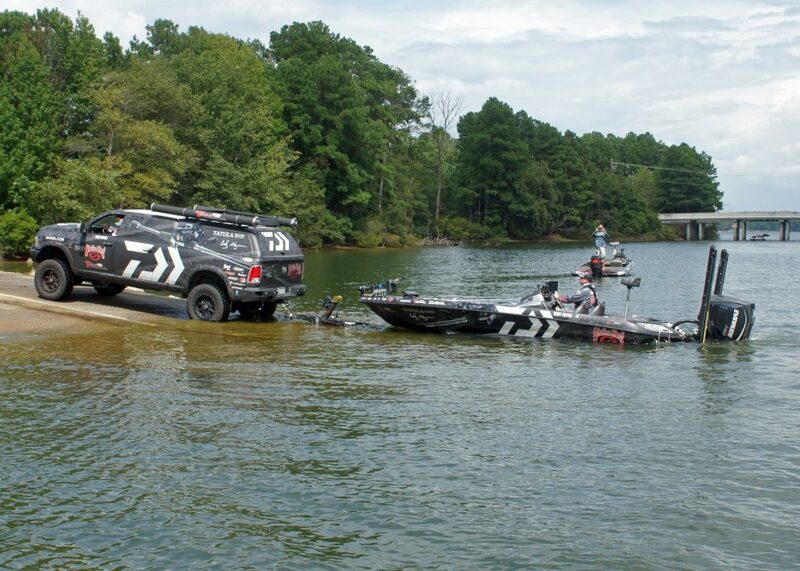 We’re loving Cody’s truck and Evinrude powered Ranger boat. 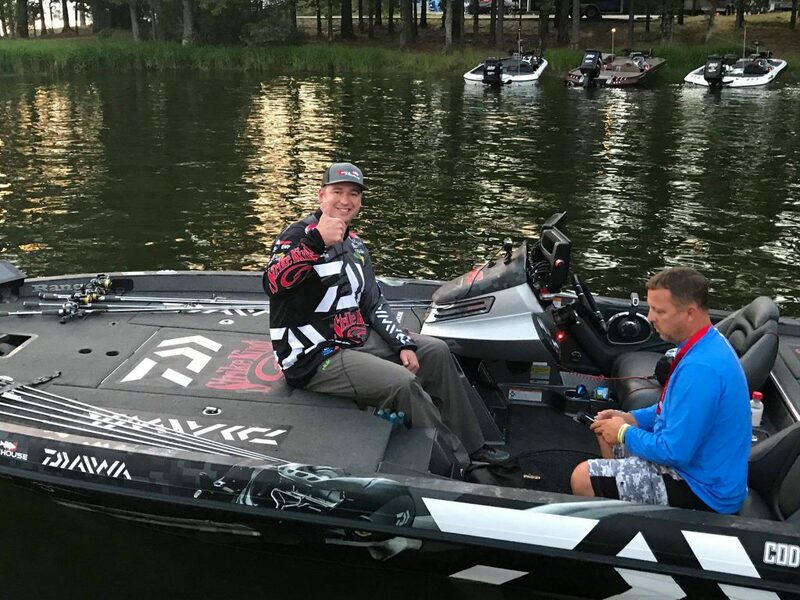 Evinrude angler Carl Wendlandt is all smiles and ready to go on day one of the FLW Forrest Cup world bass fishing championship. Carl Wendlandt hanging out with other anglers during the Forrest Wood Cup fishing tournament. Evinrude angler Wesley Strader getting ready for fishing tournament and talking with fans. Wesley Strader at day two weigh-in at FLW Forrest Cup championship. 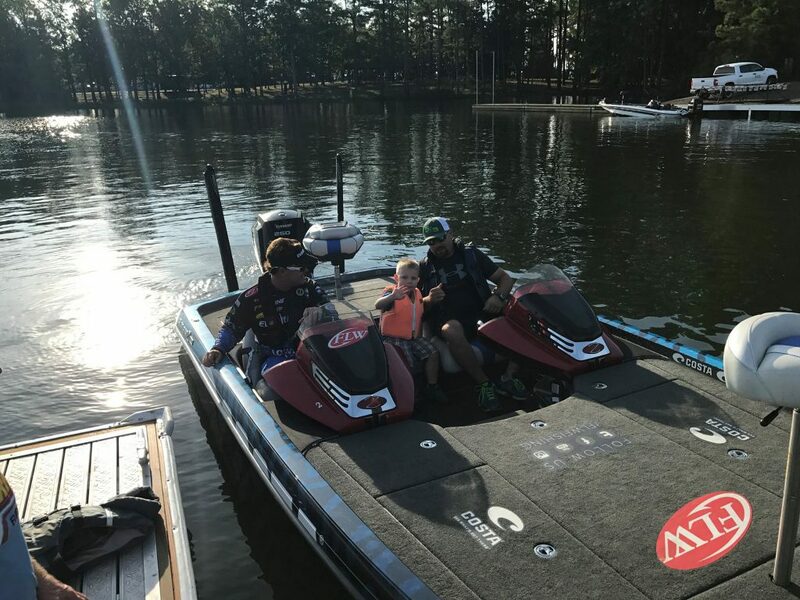 A new ‘up and coming’ Team Evinrude angler after his test ride on Lake Murray. 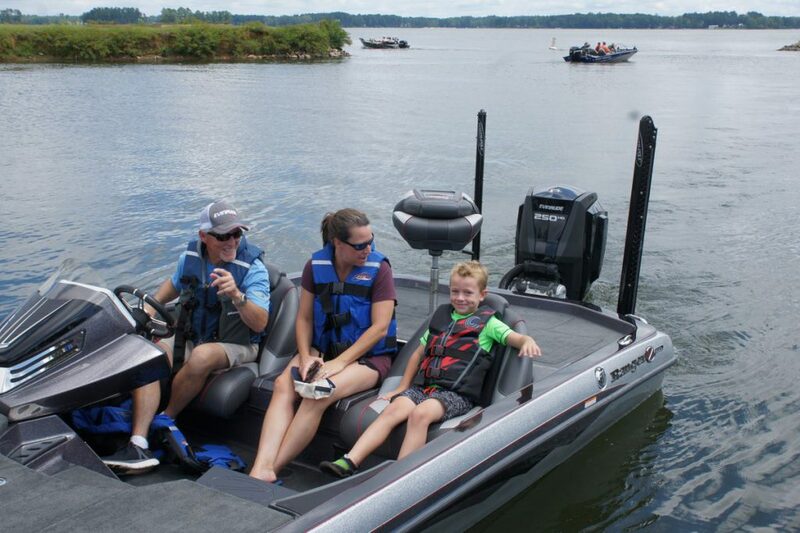 Happy smiles all around after taking the Evinrude-powered boat out for a spin! 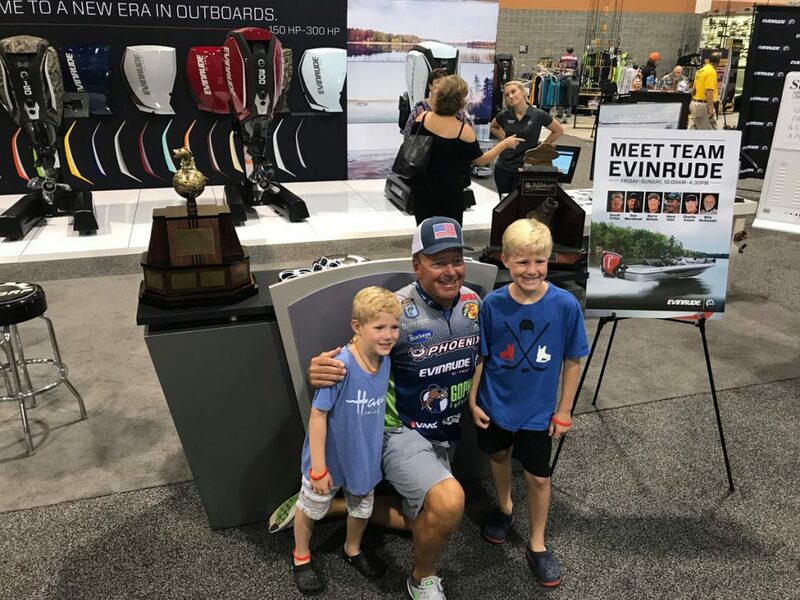 Fans young and old came by to meet Evinrude Pro Staff angler Davy Hite during the Forrest Wood Cup Expo 2017. 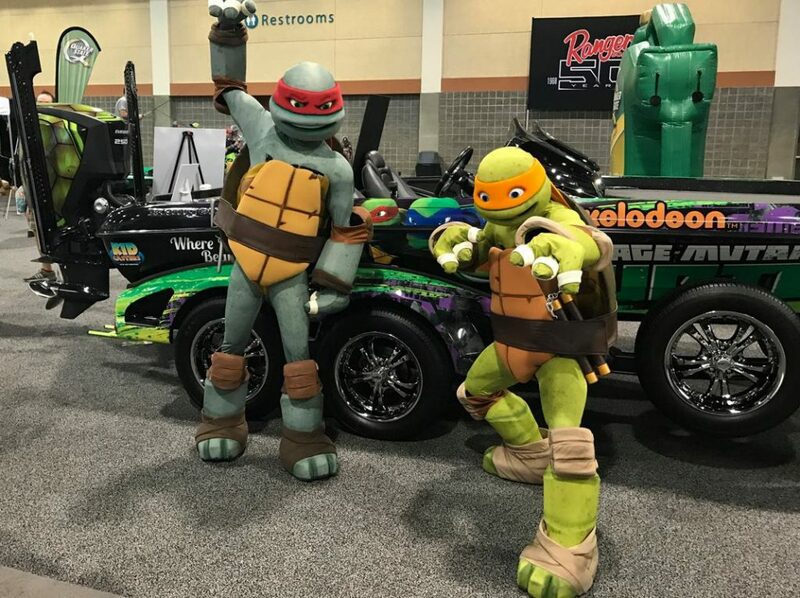 The Teenage Mutant Ninja Turtles came out to enjoy the #EvinrudeLife at the Forrest Wood Cup Expo 2017. And check out that custom designed Evinrude engine. Cool, right? Making the marketing magic happen! 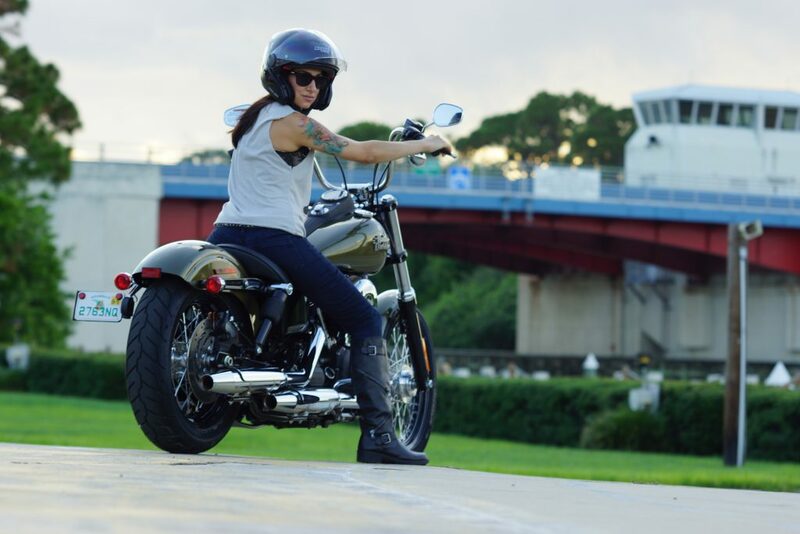 A glimpse behind the camera with a few out-takes from photo shoots we produced for Florida-based client Arnott Motorcycle Air Suspension. 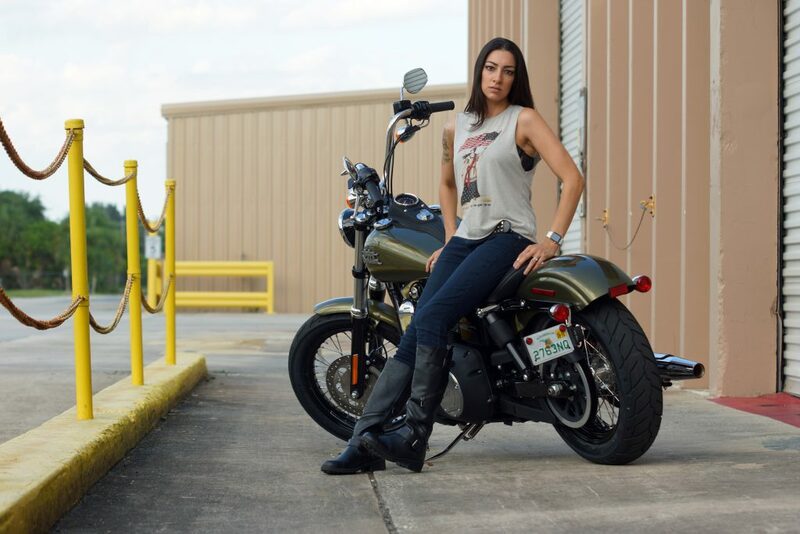 Model on Harley Davidson motorcycle at Arnott Motorcycle Air Suspension facilities near Barge Canal in Merritt Island, Florida. Parking the motorcycles and taking a lunch break at a local diner. Capturing the details visually tells the whole story. 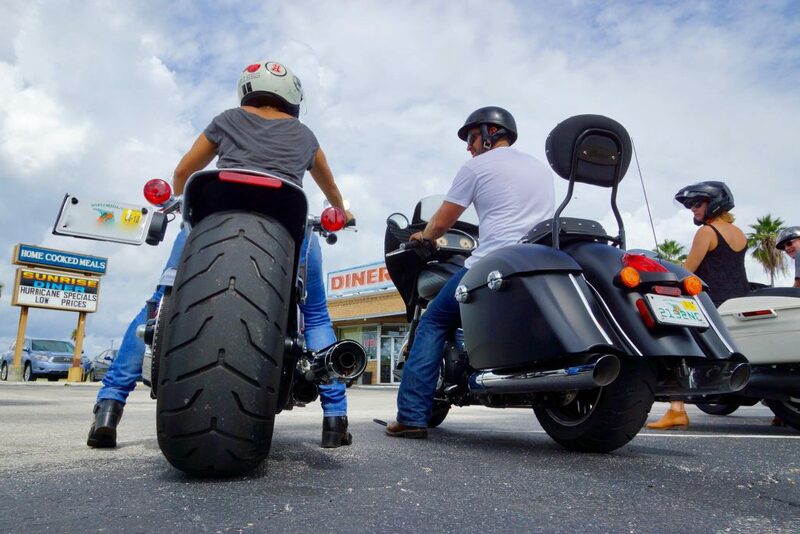 In this four-part series of social videos, we crafted an engaging story that visually narrated the exciting moments experienced as client Route 1 Motorsports saw their dream – of expanding their business with the construction of a new powersports showroom and dealership – become reality. The primary focus of the overarching video story centered on events that unfolded during two key points in the realization of their dream. The first, was the press event we produced to bring media attention to Route 1 Motorsports as they broke ground on the site of their new mega-dealership location. 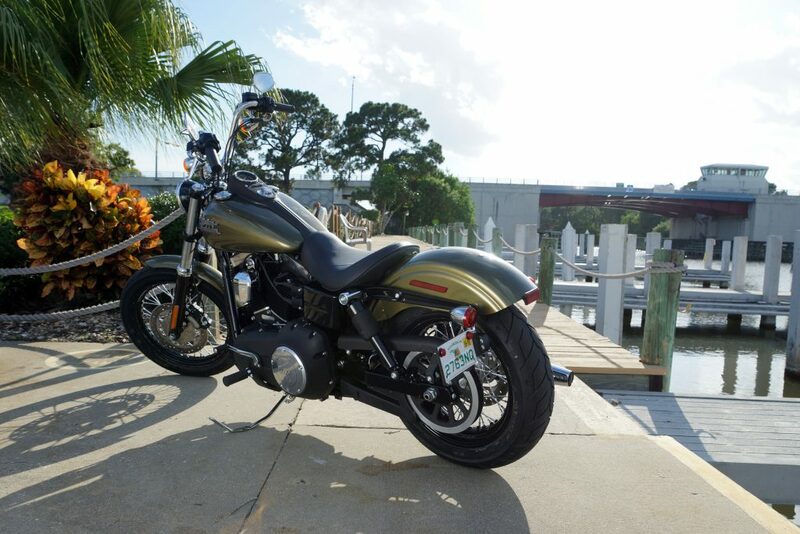 The second – which resulted in the final three videos of the series, documented the exhilarating moments from beginning to end as their vision for the new Southern Brevard County dealership took shape. Below are the videos that LOOK Marketing produced and were subsequently published to Route 1 Motorsports Facebook page and shared with over two thousand of their fans on that social channel. Combined all four videos, generated over 25,000 views and substantial buzz in the local community. 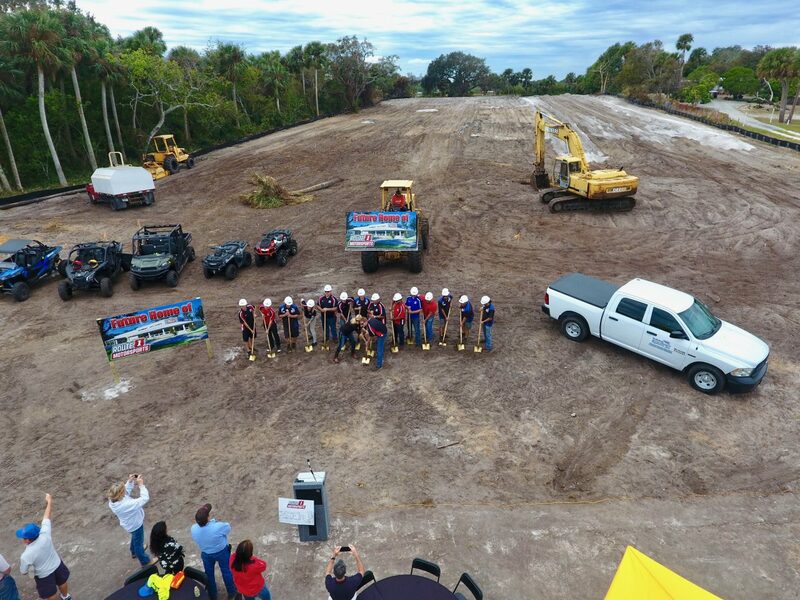 The first video in the series captured the thrilling, emotion-filled ground breaking press event day as the owners, Willy Carmine and Kellie Wright, broke ground at the site of their new facility near Malabar, Florida. In addition to our standard video production equipment, we also utilized our video drones to record sweeping aerial views of the massive lot and obtain footage of the lively show that kicked off the official groundbreaking ceremony. On social, this video garnered 14,536 views. Informed of the facility build. Engaged with the brand during the nearly year-long construction. For these construction progress report videos, we once again used a combination of traditional video production and drone videography to capture the full visual story. Combined these three videos had nearly 11,000 views. 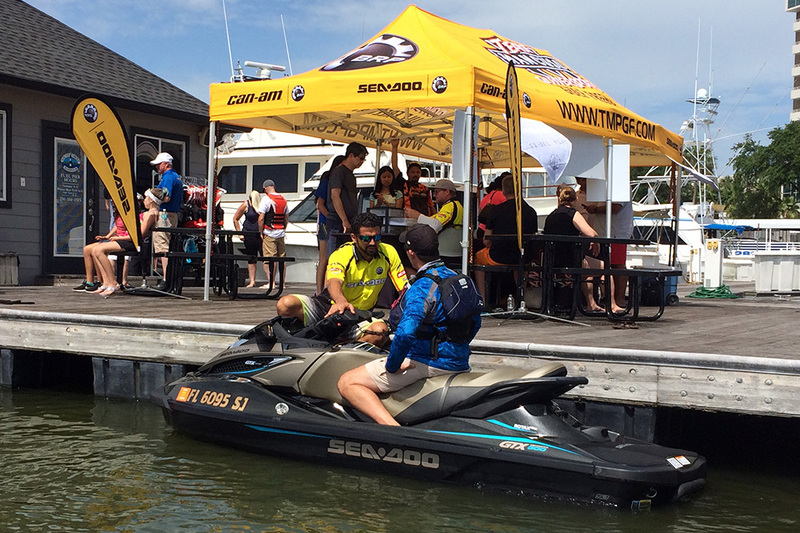 This summer LOOK Marketing’s event team produced four experiential marketing events in Texas for client Sea-Doo which resulted in highly successful demo rides and a very happy client. We’ve shared a few of our behind the scenes photos from one of the events held in Houston, Texas. 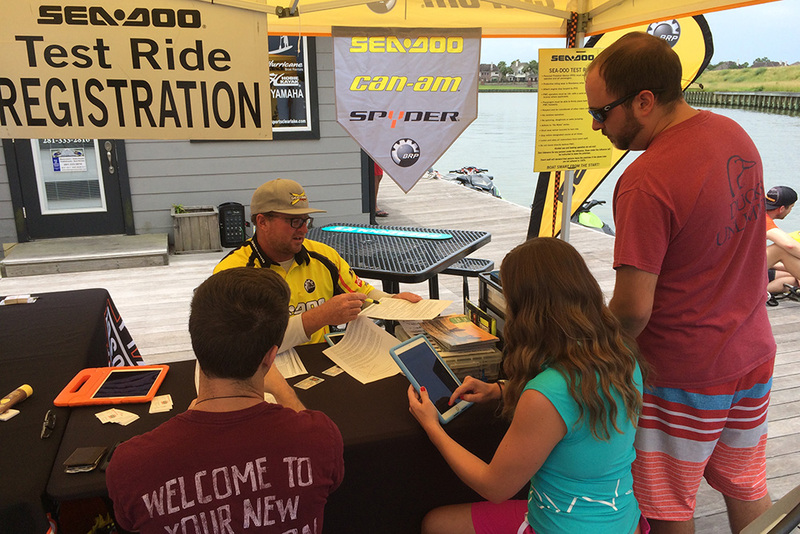 Jeremy, lead event specialist at LOOK Marketing, is prepping a customer for a demo ride on Sea-Doo‘s luxury watercraft, the GTX 300 at Team Mancuso Powersports. Tim McKercher is seen here lending a helping hand in the very busy registration tent. 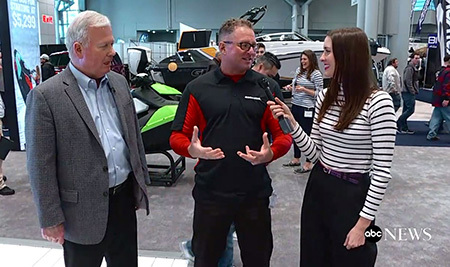 McKercher, LOOK Marketing’s founder and events’ expert, spearheaded this event marketing and production project for Sea-Doo’s Texas demo rides. 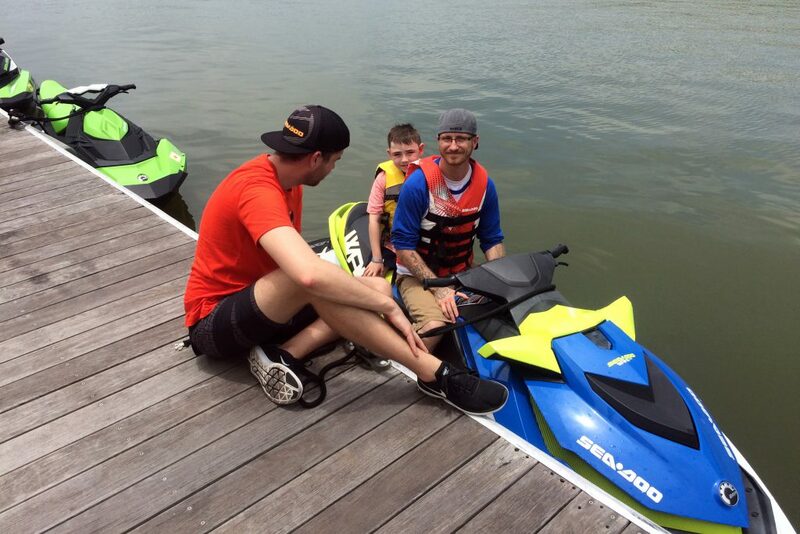 Marc-Olivier, the Global Digital Marketing Coordinator for Sea-Doo, offering some pre-ride tips to this father and son duo onboard a 2017 WAKE 155 watercraft. 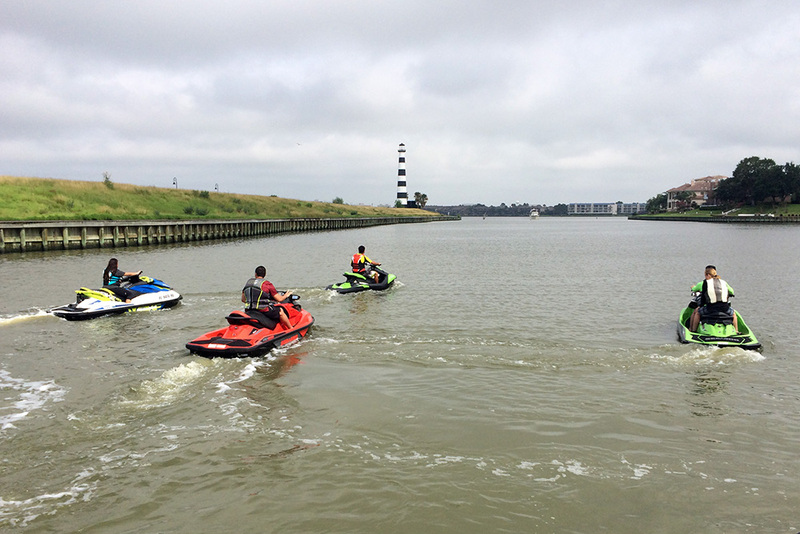 This group of riders had a blast trying out some of Sea-Doo’s most popular watercraft during the demo ride. 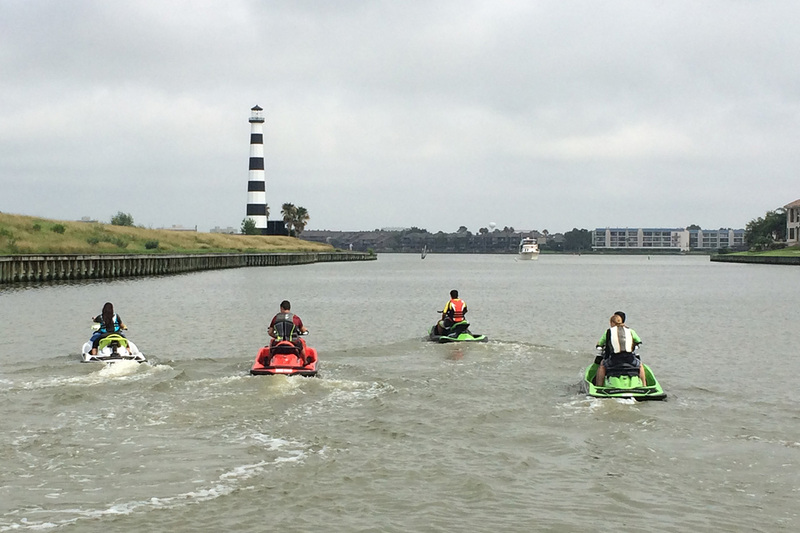 They had a fun and memorable time on the water, and experienced what it would feel like to own a personal watercraft – and more importantly, a Sea-Doo watercraft! 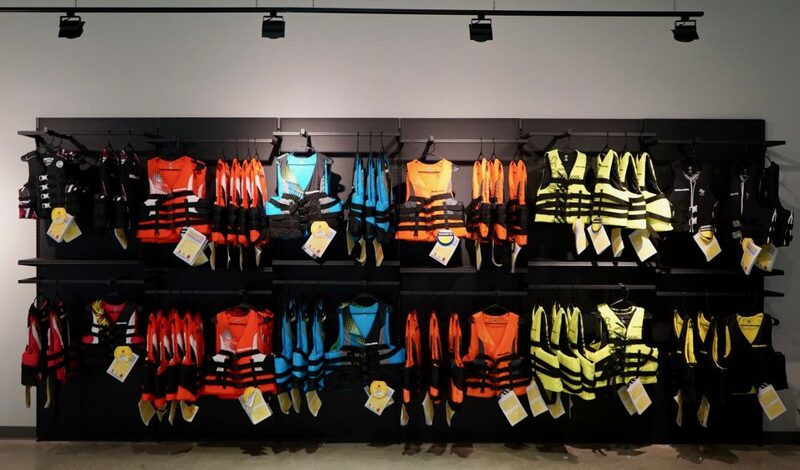 When ready to buy, these shoppers will certainly recall the awesome day on the water they spent riding Sea-Doo watercraft. LOOK Scores Coverage on Fox and Friends for Sea-Doo! 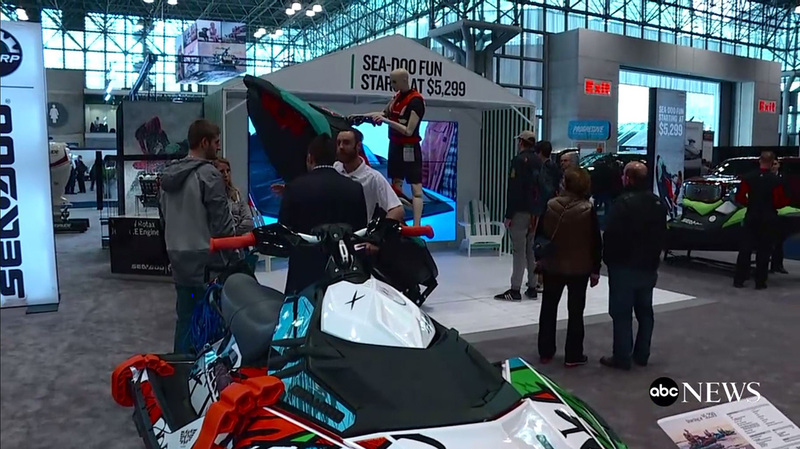 Kicking off the summer season with some awesome public relations coverage for our client Sea-Doo on America’s number one rated morning cable show with an audience of nearly 2 million – Fox and Friends! 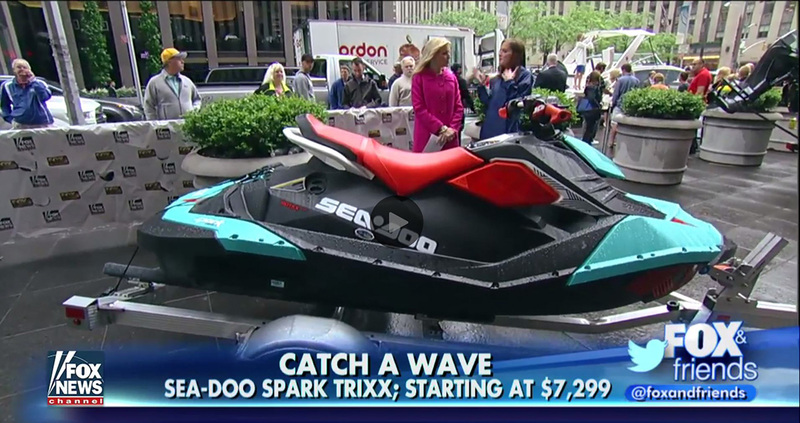 And to make this an even sweeter media relations win, Fox and Friends provided over one minute of on-camera coverage discussing Sea-Doo‘s popular 2017 SPARK TRIXX. 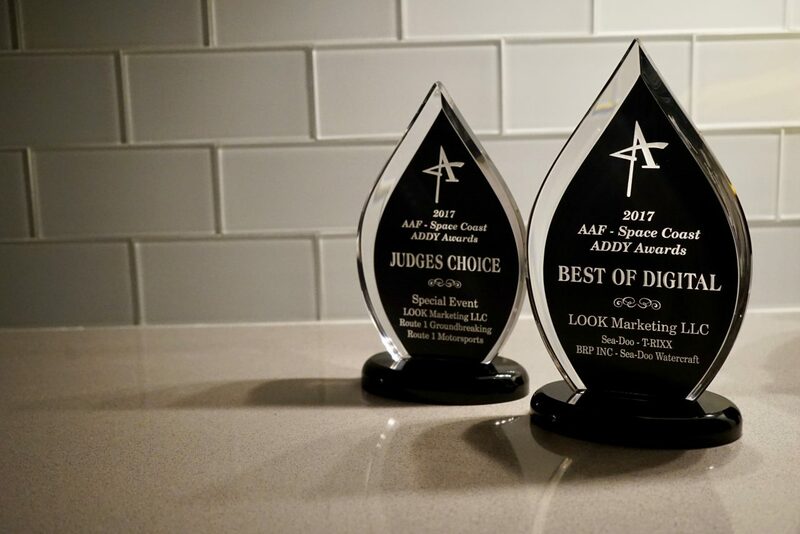 February 13, 2017 – LOOK Marketing adds to the string of ADDY Best of Awards by winning 2017 Best Of Digital and Judges Choice awards extending the Melbourne, Florida-based advertising agency’s string of receiving top honors to three consecutive years. The Space Coast American Advertising Federation recognizing the best strategic creative in a wide variety of advertising mediums through the nation wide ADDY awards program. LOOK Marketing won the Space Coast Ad Federation’s Best of Show award in 2015 and 2016 and continues to add to the award count with Five Gold ADDYs and Four Silver ADDYs in 2017 for a variety of clients in a diverse list of categories. LOOK Marketing focuses on integrated, strategic messaging through consistent and creative branding that surpasses clients’ objectives. Through the work flow process of objective defining, strategy building and flawless tactical execution LOOK is renown in the powersports and marine industries and has become one of the Space Coasts’ leading marketing agencies for a wide range of B2C and B2B businesses. 2017 Space Coast American Advertising Federation ADDY Awards won by LOOK Marketing. Judges noted this piece was a great use of leveraging a social media trend with great creative while seamlessly blending in key product features through the story telling. The video incorporated the 2016 trending T-REXX costume social media phenomenon with chase and later friendship of a caveman and a T-REXX on the new Sea-Doo TRIXX watercraft. Judges noted the objective of producing a remarkable groundbreaking event was effectively achieved from invitations to actual event production and post event leveraging via earned media and boosted social media video. LOOK Marketing, LLC is a multi-faceted Creative Agency that builds strategic Marketing Communications plans for both international and national clients. Based on Florida’s Space Coast, LOOK’s integrated services extend from public relations, social media management, and video production, to experiential marketing and merchandising design for a variety of B2B and B2C brands. 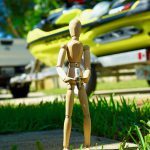 Clients include BRP, Sea-Doo watercraft, Ski-Doo snowmobiles, Can-Am off-road, and Can-Am Spyder, Evinrude Propulsion, BMW Motorrad US, Arnott Motorcycle Air Suspension, Red Bull North America, Rec Boat Holdings, The Burger Place, and Melbourne Central Catholic High School.